So you have seen a lot around here at the moment, I'm on a bit of a sewing frenzy. Well as much of a frenzy as I ever get as I jump from project to project. But it is something very high on my list because it's both a need and a want. 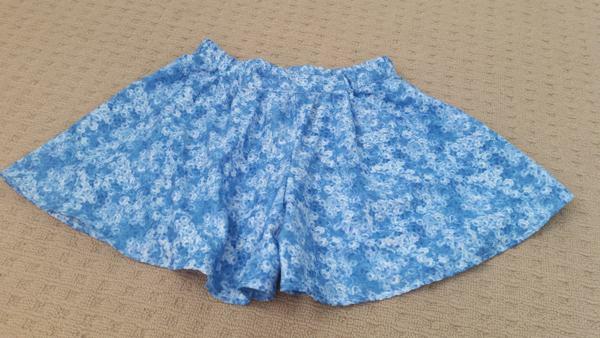 After finishing 5 pairs of the Scrappy Shorts, my next goal was some more shorts for the girl because she actually needs them right now. (They both do but not as much once they go back to school next week, they have enough school shorts.) I used another pattern from Issue 5 of the One Thimble magazine. (affiliate link) Can you tell how much I love these magazines at the moment? It's more because at the moment they have exactly what I want in them and I find the tutorials easy to follow. I think I love the variety and I know for sure they are both loving the clothes. 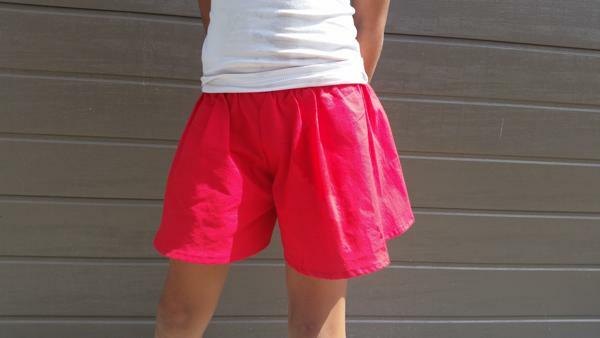 These shorts are different from the others because they are more of a skirt as well as shorts. This means she can girly while still not showing her knickers. (her words not mine). I measured her and then had a large dilemma. I talked about this before but she measures as an 8 waist but with a 12 length. So I decided to make a 10 as that is the size she wears of everything else. Ooops. So they fit beautifully but don't have any room for her to grow up. But I digress I want to tell you more about the making process first. The instructions were easy to follow and I had no issue until I came to the elastic. Now I haven't ever attached elastic before and I knew that I wasn't going to cut the amount specified in the pattern. Also after talking to grandma she didn't think that I should start the elastic from the side but from partly across the front so that the elastic hugs the hips. So instead of using the pattern I attached one side of the elastic into the front and then getting Lana to try it on and attaching it to the other side. It worked really well and they sit beautifully on her. I then traced the size 12s so she can continue to grow with the shorts. I have made her a pair of blue ones in the 12. She picked out this fabric and I love the colour. I should use these to make a scrappy pair of pants as well. Maybe a simple shirt for her too?? Sorry about the slightly out of focus fabric something about this print is really confusing the focus on the camera. It just doesn't see it right. I need to see if I can find a simple top pattern as I have enough fabric I think to make her a top as well. She loves them and is so excited to wear them. This post contains affiliate links. If you end up buying the product I get money but it doesn't cost you any more to do so. My opinions are entirely my own. Lord of the Dance and my weekend.